After finishing up a container of slim-fast the other day, I got to thinking... what can I do with this container? Yes... I could have thrown it away (and I almost did) but I liked the red lid and thought it could be cute for Christmas. I cleaned the container out well and wrapped it with some brown kraft wrapping paper I had on hand. 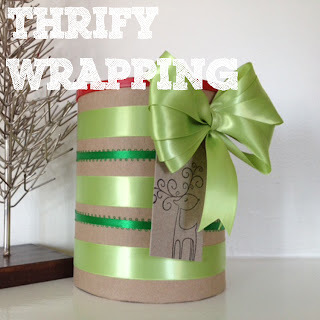 Once it was covered, I decorated it with some festive ribbons and a little gift tag. What other household goods would make a cute present holder? Cute idea for a recycle item! Thanks for sharing. Great idea! It would also be cute with scrapbook paper or even have the kids decorate the paper. Thanks for linking up to my Pin Me Party! I've pinned this under upcycle ideas. That's cute! I have an empty almond jar in my pantry that I've been holding on to. Now I have an idea of what I can do with it! Woohoo! Thanks for sharing at Submarine Sunday!